At long last, we're talking about playoffs. The Houston Texans will be coming to Foxborough Saturday night for the Patriots first playoff game, with the winner advancing to the AFC Championship game. As a one of the biggest underdogs in recent history, Houston hasn't gotten any respect from either the press or Vegas. 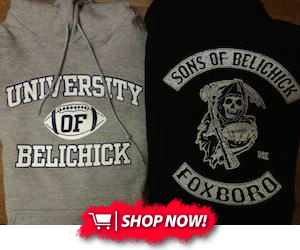 However, Belichick's Patriots will certainly prepare for them and all of their strengths, which include one of the league's best defenses and star offensive playmakers in Lamar Miller and DeAndre Hopkins. 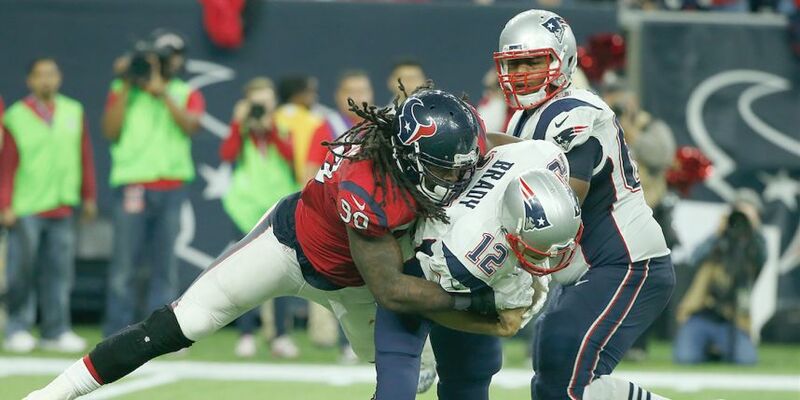 Here's a closer look at the Texans, with emphasis on how the Patriots might match up with them. One merely needs to look at the Texans offense to see why they've received so little respect despite back-to-back playoff seasons. They ranked amongst the league's bottom feeders in most major statistical categories, including the two most important: yards (5,035, 29th) and points (17.4 per game, 28th). It's remarkable that they managed a winning record, let alone a playoff win, with an offense that anemic. The biggest factor holding the Houston offense back was horrendous quarterback play. Houston swung for the fences by signing Brock Osweiler, he of the seven up-and-down career starts, to a massive contract last spring. It's a gamble that blew up in their faces this year, as Osweiler put up some truly ugly numbers. Throwing more interceptions than touchdowns (16 to 15) is certainly damning, but his paltry 5.8 yards per passing attempt might be worse. That number shows just how conservative Osweiler was with the football, opting time after time for harmless checkdowns rather than attacking downfield. Things got bad enough that Osweiler was benched back in Week 14 for Tom Savage, but a concussion suffered by Savage in the regular season finale opened the door for the "fumbling giraffe" (stealing that brilliant line from a WEEI caller) to retain his starting job in the playoffs. Osweiler's struggles forced Houston into becoming one of the most run-heavy offenses in football. Only five teams (one being your Patriots) ran the ball more frequently than their 28.5 attempts per game. They did so despite a lack of efficiency running the ball, as they ranked a mediocre 18th in yards per carry (4.1). Last week's Wild Card win over Oakland was emblematic of their season, as bellcow back Lamar Miller ran the ball a season high 31 times but had to slog his way to only 73 yards (2.35 a carry) thanks to suspect blocking. Despite that lack of efficiency, Miller was largely a success in his first season with the Texans. A high profile free agent signing, Miller chose the Texans largely due to his desire to be featured in an offense. After years of neglect despite his production as a Dolphin, he certainly got his wish with the Texans, demolishing his career high in touches despite missing the season's final two games. At 5'11" and 215 pounds, Miller isn't the biggest or most physical back, but he has the speed to gain chunks of yards if given space. It will be up to the Patriots rotation of edge defenders to keep Miller from escaping the tackle box, where his lack of tackle-breaking power can be exploited. If Miller is allowed to get around the edge, his breakaway speed makes him dangerous. The rest of the Texans running back rotation is far less imposing. Miller's primary backup is 2014 sixth round pick Alfred Blue, a bigger back who runs hard but rarely gets more than what his blocking affords him. While Miller is an every down back, veteran Jonathan Grimes will give him the occasional breather on passing downs. Like Blue, Grimes plays hard but isn't talented enough to create many yards on his own. The Texans do use fullback Jay Prosch fairly often, with the former sixth round pick grading out as one the best run blockers at the position according to PFF. 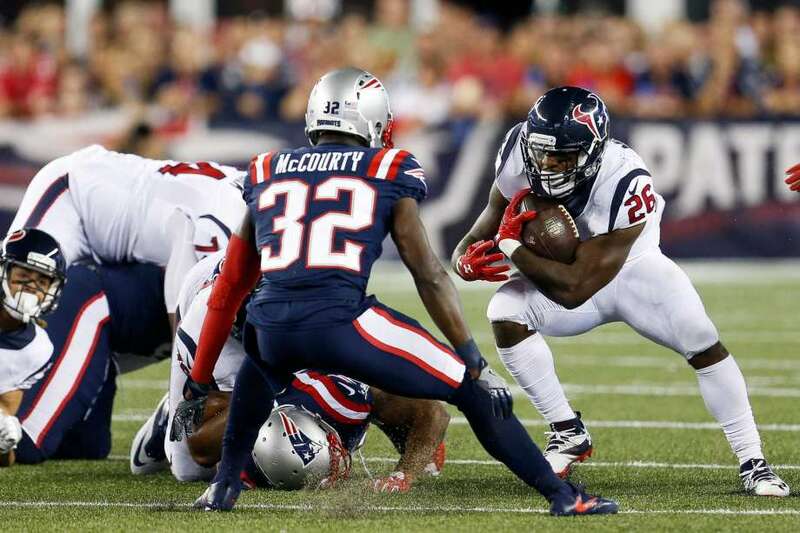 With the Texans overly reliant on the run game, expect Miller to be a focal point of the Patriots game plan. The Pats have been stout against the run all year, holding their opponents under 100 rushing yards in 10 of their 16 regular season games thanks to stout play up front from a burly defensive tackle rotation of Alan Branch, Malcom Brown and Vincent Valentine. The Texans will likely run at the Pats early and often, hoping that doing so will help to avoid dangerous situations (i.e third and long) for Osweiler. If the Pats can shut down the run early, they'll make it extremely difficult for Houston to generate offense. Forcing Houston to throw should be advantageous due to Osweiler's presence behind center, but the Pats do have some dangerous passing game targets to deal with. Chief amongst them, of course, is star receiver DeAndre Hopkins, whose insane level of production in his still young career is only made more impressive by the laundry list of mediocre or worse quarterbacks who have gotten him the ball. Hopkins production took a dip this year thanks to Osweiler, but he remains one of the most dangerous wideouts in the game. He illustrated that last week, making an impressive over-the-shoulder catch for a big play before capping the Texans drive with a touchdown on a well-ran slant route. That big play was one of the few offensive sparks of the day for the Texans, who still took most of the game to put a beaten up Raiders club out of their misery. Can the Pats and Ryan neutralize Nuk for a third straight contest? The Patriots have used the same strategy to limit Hopkins both times they've faced him, and will likely go back to the well until Houston figures out an effective counter. Logan Ryan has been the primary defender on Hopkins both games, using his physicality at the line of scrimmage to throw off Hopkins' timing. While Ryan has deserved much of the praise he's received following both games, it's worth noting that the Patriots have generally shaded a safety Hopkins' way in both games. 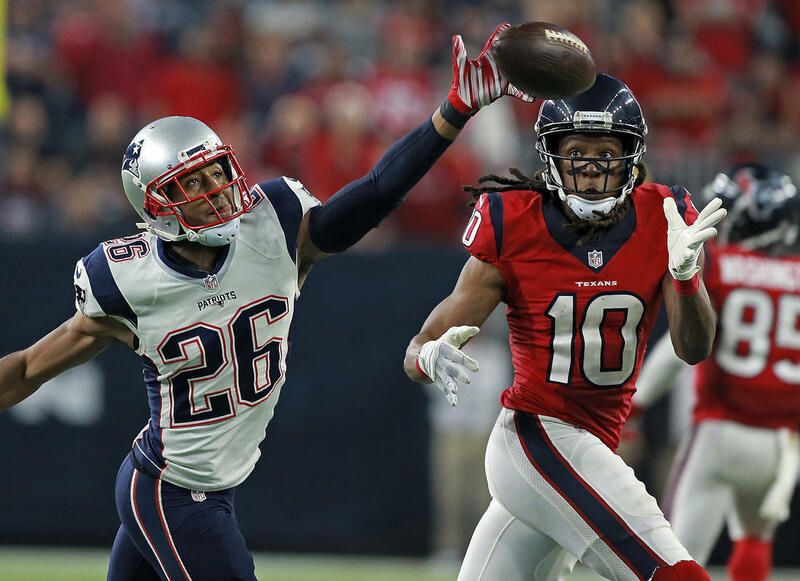 With the man they call Nuk clearly the Texans biggest threat, the Pats have found it well worth devoting extra resources to make it as difficult as possible to get him the ball. Their Week Three matchup proved that Hopkins will make the occasional incredible catch no matter how much attention is devoted to him, but Nuk finished that game with four inconsequential catches for 56 yards, despite several of those grabs being highlight-worthy. With Ryan likely to stick with Hopkins, Malcolm Butler will likely be assigned to first round rookie Will Fuller. Fuller had an inconsistent first season, flashing both the big play potential and questionable hands that dominated every scouting report of him as a prospect out of Notre Dame. However, his pure speed (4.32 40 time) makes him a constant threat that must be accounted for on every play. Not keeping a safety over the top is a risky proposition against Fuller, who any given play could outrun his coverage defender for a big play down the field. That makes Butler, who has by far the best deep recovery speed of the Patriots corners, the best coverage option against Fuller. With that said, regardless of the Patriots trust in Butler, I would expect the Pats to use plenty of two deep safety looks this week, with one shaded to Hopkins and another back deep to prevent Fuller or anyone else from making a game-changing big play. In fact, due to the Texans heavy usage of their tight ends in the passing game, I wouldn't be surprised if we see plenty of three safety nickel packages from the Pats this week. Neither CJ Fiedorowicz nor Ryan Griffin put up particular impressive individual numbers, but the duo combined for 163 targets, 104 catches, 1,001 yards and six touchdowns. Fiedorowicz stayed on the field more due to his superiority as a blocker, but Griffin saw his fair share of playing time as an athletic "move" tight end type. If the Patriots go with more man coverage this week, I would expect Patrick Chung to spend plenty of time against whichever of those two is on the field, with Duron Harmon and Devin McCourty patrolling the back end of the secondary. 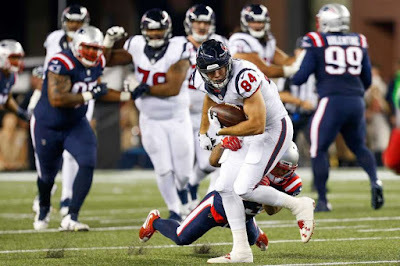 When the Texans throw out of two tight end alignments, Griffin's superior athleticism will likely draw Chung's attention, with one of the linebackers likely responsible for the plodding Fiedorowicz. Another reason to expect plenty of "big nickel" (aka three safeties, two corners) this game is the Texans lack of receiver depth. The Texans have spent third round picks on the receiver position in each of their last two drafts, landing Jaelen Strong and Braxton Miller, but each of these intriguing talents finished the 2016 season on injured reserve. As a result, the Texans are down to 2015 fifth round pick Keith Mumphery and undrafted rookie speedster Wendall Williams behind the starting duo of Hopkins and Fuller. With Williams only recently promoted to the active roster, Mumphery is the de facto third receiver. A bigger, possession-type receiver with limited athleticism, he's hardly made a dent as a little-used role player in a poor passing offense. Expect the Texans to largely stay away from three receiver sets, utilizing two tight end or power-based two back sets instead. When Williams is in the game, the defense will have to be aware of his deep speed, as the college track star broke records with a 4.19 40 time in the pre-draft process. Against an offense with these kinds of limitations, the game plan becomes pretty simple for the Patriots. Stop the run, take away the big plays in the passing game, and force Osweiler to beat you by dinking-and-dunking his way down the field. It's a strategy that will call on this unit to continue it's strong tackling, especially against the speedy Miller, who should see his fair share of checkdowns out of the backfield. Miller's 39 targets were fifth on the team, trailing only Hopkins, Fuller and the two tight ends. While pressure can only help in forcing Osweiler into mistakes, there's no need this week for the Pats to put heavy resources into generating a pass rush. As long as they can prevent the big play down the field, they'll be confident in their ability to make tackles against Osweiler's checkdowns, keeping the Texans out of favorable situations. Furthermore, Houston's mediocre offensive line could allow pressure on it's own. Left tackle Duane Brown remains one of the league's best, and second year man Greg Mancz turned in an impressive season at center after projected starter Nick Martin was lost to injury in the preseason. However, the right side of the line has been a mess. Starting right tackle Derek Newton was lost to injury and his replacement, veteran journeyman Chris Clark, has been an absolute liability in protection. Meanwhile, right guard Jeff Allen has failed to replicate the strong 2015 form that made him a well-paid free agent signing last spring. On the other side, Xavier Sua-Filo has failed to develop into the mauler the Texans projected when they made him the first pick of the second round back in 2014. Either guard will be mismatched if expected to block Trey Flowers one-on-one on passing downs. They could also have plenty of trouble if Matt Patricia gets his linebackers, particularly Dont'a Hightower, involved in the pass rush with disguised pressure packages. Here's where this matchup gets more interesting. The Texans defense comes in as one of the best units in the NFL, despite losing the game's best defensive player in JJ Watt. Even without Watt, a pass rush led by first round picks Jadeveon Clowney and Whitney Mercillus has combined with a deep and talented secondary to form one of the league's top pass defenses. Meanwhile, the run defense has turned around from a shaky start to turn into one of the more stingy units in football, holding opponents to an average of just 71 rushing yards per game over their past 10 contests. The Patriots won't be expecting to bulldoze this team on the ground, but their ability to continue to run the ball will be essential. Becoming one-dimensional and resorting to a pass-happy approach will open the door for Houston's pass rush to take over, following the blueprint that the Giants and Jets used in past Patriots playoff upsets. Contrary to popular belief, the Patriots haven't been a great rushing team this year (they averaged 3.9 yards per attempt for the season, a figure that ranks 25th in the league), but their commitment to the running game has clearly paid dividends for their offense. With defenses forced to honor the threat of the run throughout, their diverse passing attack has become far more difficult to defend. Furthermore, the Pats running game has been able to wear down their opponents throughout games, with three quarters of tough and inefficient gains rewarded with big plays and game-salting first downs down the stretch. As expected, Vince Wilfork remains a big part of the Texans success against the run. At 35, Big Vince isn't the dominant force that anchored the Patriots defensive line for a decade anymore, but he remains a tough player to move at the point of attack. The Pats will likely have to double team him if they want to have success running inside. Vince headlines a rotation that also includes massive rookie DJ Reader, who has flashed potential as a Vince-like space eater in the middle, and Christian Covington. Veteran Antonio Smith will sub in for one of the bigger bodied tackles on passing downs, but at 35 he's shown little of the pass rushing juice that once made him a borderline star. The bigger factor in the Texans improvement against the run has been their play at linebacker. Brian Cushing might have more name recognition, but the breakout season of 2015 second round pick Bernardrick McKinney has been huge for this defense. McKinney is a big, athletic specimen who excels at coming downhill with force in the running game. It will be essential for the Pats to get a hat on him, but they can't ignore Cushing either, who remains productive if not quite the dominant force he was before suffering several major injuries. Former Michigan State thumper Max Bullough will rotate in on early-downs, but his lack of coverage ability limits his snaps when the Texans play nickel, which they likely will do plenty against the Patriots diverse group of passing game weapons. 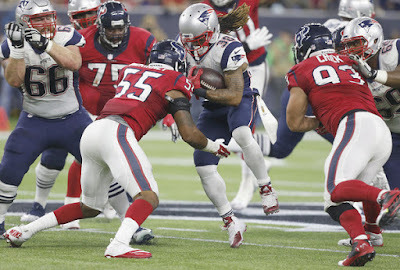 McKinney and Cushing's tackle production has been increased by the play of the sterling rotation at outside linebacker, where both Jadeveon Clowney and Whitney Mercillus have excelled at setting a strong edge and funneling runners back into the teeth of the defense. Both players receive more press for their pass rush abilities, but deserve credit for developing into complete players (linebackers coach and former Patriots standout Mike Vrabel deserve plenty of credit for their development as well). Speaking of Clowney, he's deservingly received plenty of attention this week after a dominating performance against the Raiders last week. Clowney's pure explosion of the snap is eye-popping, but he's far more difficult to match up with due to the Texans willingness to move him all over the defensive formation. Clowney's build suggests that he should be an edge rusher, which he does plenty of, but he'll also move inside where his explosive first step makes him an extremely difficult assignment for guards and centers. The Texans could try to scheme opportunities for Clowney against rookie left guard Joe Thuney, who has been by far the Patriots weakest link in pass protection. Expect the Pats to adjust their protection schemes each down based on where Clowney lines up, making it imperative for tackles Nate Solder and Marcus Cannon to handle their one-on-one matchups against the severely underrated Mercillus. With John Simon adding a third productive to that rotation, the Texans can roll out plenty of tough-to-block defensive alignments with all three rushers on the field on passing downs, often with Clowney inside to victimize interior lineman. McKinney's involvement as a capable blitzer from his linebacking spot adds another pass rushing element to prepare for. With that pass rush posing such a threat, the impetus will land on the Pats pass catchers to get open quickly against the Texans excellent secondary. 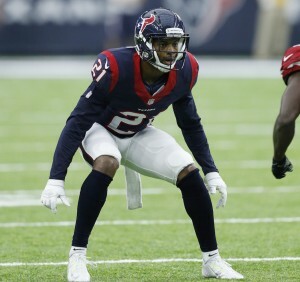 They lost productive 2015 first round pick Kevin Johnson to injury but haven't missed a beat thanks to the emergence of AJ Bouye, a 2013 undrafted rookie who has developed into one of the top cover corners in football. In fact, Bouye finished his breakthrough 2016 with the second highest PFF grade amongst corners, tying Chris Harris Jr for their highest coverage grade in the process. With Bouye emerging as a star, the Texans have been able to stick with their preference for man-coverage in the secondary. He's flanked by two former first round picks, with Jonathan Joseph opposite of him and Kareem Jackson manning the slot. Both veterans remain productive, although Joseph has seen his play decline some in his age 32 season. It's a tough on-paper matchup for the Patriots, but the good news is that they have plenty of skill position players and an offensive playbook that excels at defeating man coverage. Julian Edelman in particular eats up man coverage, where his quickness makes him a very tough matchup. Healthy and fresh as lettuce after seeing his workload strategically managed in the regular season, Edelman could follow up his explosive Week 17 performance with another big game, as the Patriots will likely use a steady diet of pick plays and crossers to try to get him involved early and get Brady in a rhthym. It will be interesting to see if the Texans go out of their comfort zone at track him with Bouye, their best corner, or whether they stay with what got them there and keep Jackson in the slot when Edelman lines up there. While pick plays (think Clemson's game winning touchdown Monday night), bunch formations and crossing routes are good ways to counter man coverage, so is having playmakers from the non-receiver skill positions who can create mismatches against linebackers and safeties. The Patriots have a number of those, headlined by Martellus Bennett, James White and Dion Lewis. The Texans have received solid safety play this season, but their top player at the position, free safety Quintin Demps, is battling a hamstring injury suffered back in Week 17. Demps managed to give it a go in last week's playoff game, only to be forced out of action 15 snaps in after re-aggravating his balky hammy. He's been a limited participant in practice this week, but will be a wounded player worth targeting if he does suit up Saturday. If he can't go, it will be Corey Moore promoted into a starting role alongside strong safety Andre Hal. Moore, an undrafted rookie from last season, has earned respectable grades from PFF this season as the team's third safety, while Hal is a 2014 seventh rounder who is better against the run than in coverage. The Texans will also include veteran Eddie Pleasant in the mix, typically as a dime package linebacker replacing Cushing. The Patriots will take Bennett, who appears to be finally healthy after grinding through the regular season hampered by an ankle injury, one-on-one against any of these guys. Likewise, while the Texans linebackers have been respectable in coverage, either White or Lewis one-on-one against them split out wide is a match up that should favor the Patriots. If the Patriots receivers struggle early against the Texans strong trio of corners, look for them to attack the mismatches they can create elsewhere through their backs and tight ends. Special teams were a big factor when these teams met back in Week 3, as the Patriots forced two fumbles from Houston returners to turn what was still a close game into a blowout. That game wasn't particularly representative of the Texans season on special teams, where they've generally been decent. Rookie Tyler Ervin was responsible for one of those fumbles back in Week 3, but he's settled in to have a solid first season as Houston's primary return specialist. Ervin was particularly good on punts, averaging a solid 9.7 yards per return. Will Fuller also occasionally saw time back as a punt returner, where he had the team's lone return touchdown back in Week 4. The Texans were less adept at covering kicks and punts. They allowed a touchdown in each category and gave up good yards in both category, including a less-than-ideal 9.9 yards per punt return. Opponents started their average drive against the Texans at the 29 yard line; only seven teams handed their opponents better field position on a drive-to-drive basis. With the always dangerous Edelman likely to handle punt return duties this playoffs, there could be an opportunity for a big play against former Patriots standout and current Texans assistant Larry Izzo's coverage units. Things were a bit better for the Texans in the kicking game. Seemingly ageless punter Shane Lechler had yet another reliable season, averaging 47.5 yards per punt. Meanwhile, placekicker Nick Novak was pretty good by the low standards NFL kickers set this season, making every field goal within 40 yards and remaining fairly accurate from 50 yards in. His three missed extra points did put a bit of a blemish on an otherwise solid season.